on the weekends, i love love love going out to breakfast. there’s nothing like waking up with a long, lazy day stretched out ahead and shuffling down to a local eatery for a relaxing meal in the sun. this past weekend, due to the fires, the husband and i decided to spend sunday on the west side, to get away from the thick haze of smoke and ash. we found ourselves at the culver city m café for the first time. while the melrose location is often packed and unpleasant, the culver city spot had a healthy crowd, but there were still plenty of comfortable places to sit. it’s much bigger than the melrose m café, and the clientele are all around less douchey. the culver city m café still serves up the same great food, though, as its sister location. this was my first time ever trying an m café breakfast, and it was even better than all my other favorite items on their huge and delicious menu. the vegan benedict at this place was not to be believed. being the breakfast-lover that i am, i hold my meals to very high standards, and i can safely say that this was perfect. most breakfast serving restaurants in this town have their own vegan version of eggs benedict, and i’m makin’ it my mission to try them all. m’s is sooooo good though, i don’t see how it can possibly be beat. it pwns the worthy opponents over at flore and follow your heart. 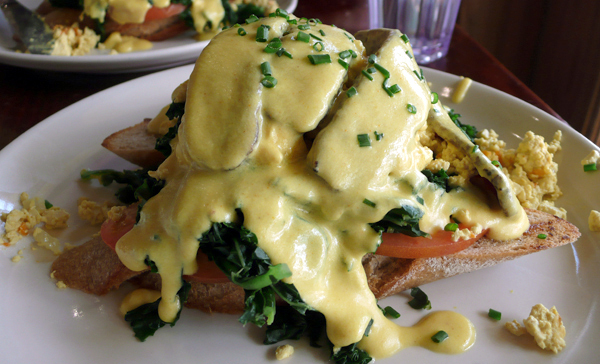 what makes this benedict so great isn’t the fresh kale, the smokey tempeh bacon, the fluffy tofu scramble or the crispy bread. uh uh. 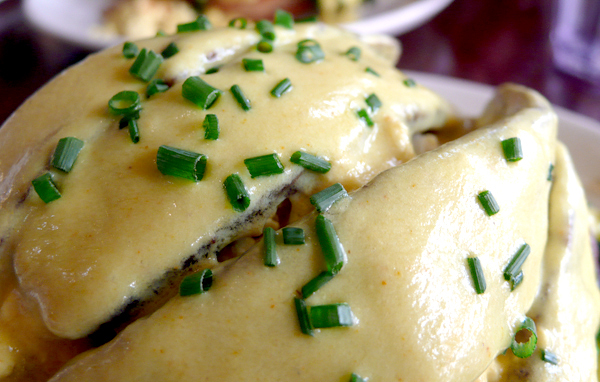 it’s the creamy and rich eggless hollandaise sauce. i don’t know how they make it, but it’s so tangy and full of flavor. it has a pretty strong mustard taste, but in a very good way. it mixes so well with the light tofu and completely penetrates the slices of grilled bread. this sauce gets all over everything and makes the whole plate tasty. so as you can tell, i can’t speak highly enough about this vegan benedict. it made a leisurely weekend breakfast the highlight of the day. i’d like to try all the other crap on m cafe’s breakfast menu, but i don’t think i will be able to resist ordering the vegan benedict every time. so check out the m café culver city outlet if you haven’t already. it’s about 3 times the size of the melrose location, and a lot nicer. plus, you can park for free for 2 hours at the trader joe’s complex right across the street. and most importantly, it has GREAT FOOD! I love the FYH Tofu Benedict, so this sounds like a must-try! I used to get an amazing Tofu Benedict in Minneapolis. I’ll have to get over there to try an relive the experience. Drooling! So nice to hear the people at the Culver City location are less douchey… the douche factor along with the push & shove to squeeze into a small space factor at the Melrose location are the main reasons I don’t eat there 3 times a day. i passed M Cafe twice last week dining out in Culver City and now totally will make a point to try it soon!